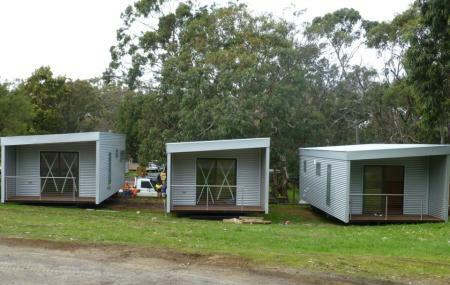 Find hotel near Cape Otway Camping & Cara .. If you are searching a place for a family outing, head to Bimbipark. This RV park offers outstanding facilities for a great entertainment. This place is perfect for kids as it provides a lot of engaging activities for them. The park offers these activities every day. These include rock wall climbing, Glow worms, and horse riding. If you are coming with your mates, go camping here and cook something delicious at the barbecue. The park is very clean and well-maintained. For the camping lovers, there is an indoor kitchen as well. Indeed, this place is worth your time and money. Use Cape Otway trip planner to visit Cape Otway Camping & Caravan Park - Bimbipark and many others to your visit. You won't miss your home when in Cape Otway, hotels in Cape Otway like Marengo Holiday Park, Motel Marengo and The Boomerangs At Johanna offer some of the best places to stay in the city. Draft the best Cape Otway vacation packages using ideal templates offered by TripHobo. Also explore how to reach Cape Otway on the go! Love this? Explore the entire list of places to visit in Cape Otway before you plan your trip. Fancy a good night's sleep after a tiring day? Check out where to stay in Cape Otway and book an accommodation of your choice. By Susana Carolina García M.
Stayed there in December, and was one of the best places to camp, it is not cheap but absolutely worth the money. Customer service was amazing even tho the park was packed and we didn’t have a booking. The guy who received us located a great space for our 2 tents and we slept under 3 Koalas. Fire was permitted so we had a nice little fire going for a bit. One of the Koalas was a mum and had a little koala under her, very cute. There is power in the kitchen and toilets so we could charge up our power banks. The place was clean and we didn’t have any problems in the kitchen or toilets. Prepare to walk a bit to the toilets and pay for the shower ($1 x 3 min) but it is understandably as water is supplied by tanks. I loved the place and would recommend it to anyone travelling to the Great Ocean Road. Our family had a wonderful time at Bimbi Park. Great facilities with friendly and helpful owners. We booked out next site the day we left! This will become our yearly little getaway. Be prepared when you take the shower - it takes $1 coin for 3 minutes of water and half the time the water is lukewarm. Other than that the site is excellent. I was greeted by very friendly staff. Many activities to choose from including outdoor climbing and mini golf. If you want to see a koala just look where the dog Jak fixated his eyes at. I've been traveling trough all Australia and it was the worst camping park I've been. The staff was EXTREMELY RUDE, we had to pay to take a shower, the park kitchen was dirty, the access to the camping park was horrible, no, I don't recommend at all this place.